The career of Seattle-based jazz vocalist Ernestine Anderson is noteworthy both for its prolific output of more than 30 albums, and the more than 60-year span of her career. Born in Houston, Texas on November 11, 1928, as a child she joined her father and grandmother in the gospel choir of her local church. At 12 she won a regional talent competition. In 1943, her first gig was with the band of trumpeter Russell Jacquet. With her family she moved to Seattle, Washington in 1944. At 18, she toured with the Johnny Otis big band; at 20, she married and began her own family. Throughout her career, she alternated returning to Seattle to be with children and family, with periods of going out of town or country to focus on her career. In 1952, famed big band leader Lionel Hampton had an opening for a new singer. With the encouragement of her husband, Anderson auditioned, backed up by the Ray Charles trio, then in Seattle. She was hired, and toured with the band for 15 months; fellow Seattle native Quincy Jones was in the trumpet section. When the band began a European tour, she returned to Seattle and spent time raising her children. Returning to her career, she performed at the first Monterey Jazz Festival in 1958. During a successful tour in Sweden, she recorded her first solo album, later released by Mercury Records under the title “Hot Cargo.” An August 4, 1958 cover of Time magazine followed, and she was named the “Best New Vocal Star” by Down Beat magazine in 1959. Anderson had a hiatus from recording in the early 1960s, following the end of her Mercury contract. She became depressed, and has credited her 1969 discovery and practice of Buddhist chanting with her recovery. In 1976, Concord Records approached her with a record deal. She released her first album on the Concord Jazz label in 1977, and her career took off again, recording 14 albums in the next 15 years. She performed with pianists Gene Harris and George Shearing, and bassist Ray Brown. Later, she signed with Quincy Jones’s label Qwest, releasing “Now and Then” in 1993, and “Blues, News and Love News” in 1996. Both were nominated for Grammy awards. 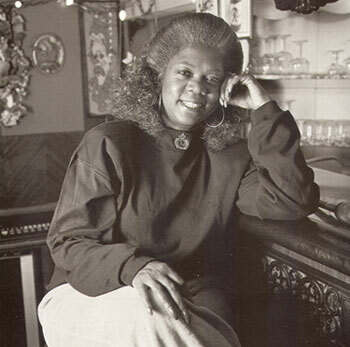 Ernestine Anderson died on March 10, 2016 in Seattle, Washington. She was 87. Paul De Barros, Jackson Street after Hours: the Roots of Jazz in Seattle (Seattle, Washington: Sasquatch Books, 1993); http://www.ernestineanderson.com; http://www.npr.org/programs/jazz.